Providing you the best range of Ointment-Manufacturing-Vessels, Sterile Vessel, Storage Vessels (Receiver), Sterile Filling Vessels, Ointment Vessel and Jacketed Vessels with effective & timely delivery. We offer a wide range of Ointment Vessel to our clients. We are counted among one of the leading manufacturers and suppliers of Ointment Vessel. These vessels are used in pharmaceutical industry for storing liquids, solutions or pharmaceutical raw material and chemicals. We are engaged in providing our clients with a comprehensive range of Sterile Vessel. As part of that, the company offers Sterile Vessel. We are engaged in manufacturing and supplying a robust range and premium quality Sterile Vessel. Being the leading names in the industry, we are into manufacturing, supplying and exporting a technically advanced array of Sterile Vessels. We customize our product as per client requirement. Available from 50 Ltrs to 20,000 Ltrs or Bigger Capacity. Top dish end type with manhole sight glass/Light glass/inlet/CIP and other Nozzles. Jacket can be MS on S.S.
Bottom ball valve or flush bottom valve. Stiffeners between Shell & Jacket. Heating can be electrical/Steam/thermic Fluid. For fully closed Vessel CIP/SIP provided for cleaning. Top can be Flange end with I–bolts. Bottom Torrispherical/Hemispherical/conical or plain depending on requirement. Finishing as per cGMP,Smooth Joints. 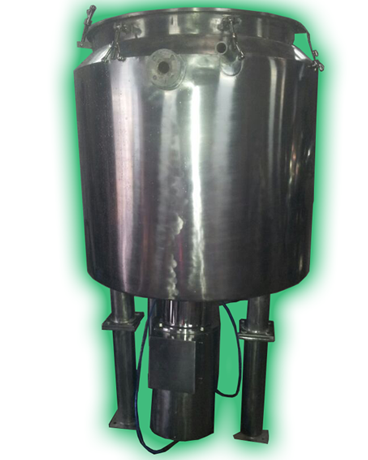 Vessel can be provided with Stirrer/Homogenizer arrangement. Stirrer Anchor/Propellor/Paddle/Turbine type or as per requirement. We are manufacturing Vessels in Mild Steel/Stainless Steel depending on customer requirements. The Fabrication is as per TEMA/ASME SEC VIII Div 2 standard. The Vessels are supplied in Vertical/Horizontal with dish end Top & Bottom (if Top is open type plain lid is provided) conical Bottom, Vessel is mounted on Legs or Lugs joints either Electric arc welded or argon arc welded. In case of MS Red oxide coat with epoxy painting or rubber lining in S.S. argon arc welded with smooth finish Mirror polish contact parts outside dull finished. 5 Ltrs. To 500 Ltrs. Internally and External mirror polished to 300 grit. All joints are welded by argon arc process grinded to smooth finish from inside and outside and Vessel is provided with Silicon “O” Ring and Ring nuts with I bolt on the lid. Owing to the extensive industry experience, we are capable of providing our clients with a wide assortment of Sterile Filling Vessel that has mirror polished surface. Moreover, our range has collapsible handle, which assure easy handling. These filling vessels provided by us across various industry verticals are designed strictly according to the ASME codes and requirements of our esteemed clients. The range of ss filling vessel provided by us is used to fill the packaging with the material with high efficiency. We are involved in providing an array of Jacketed Vessels to the clients. These products are manufactured using optimum quality raw material and technically advanced machines. We also offer a MS structure for the support of these vessels. We hold expertise in offering a wide range of Stainless Steel Pressure Vessels to our esteemed clients. Using high quality stainless steel and carbon, these products are designed and manufactured in accordance with the industry set quality. In built C.I.P. / S.I.P. We are one of the most popular manufacturers and suppliers of a variety of Pharma Reactor Vessels. These are fixed with the tubular stands, stirrers and vessels for proper functioning. Designed and developed as per worldwide commercial requirements.